Making good violins is even harder. An excellent violin is a real work of art. Perhaps that explains why the design of classical violins has remained virtually unchanged during the past 400 years. Violinists, and violin makers, regard it as something sacrosanct. But about 50 years ago, I started to wonder why we can’t use modern materials, modern design ideas and modern production techniques to make excellent new violins to meet the needs of modern players. People want different things from a violin nowadays than they did in the 17th century. or “I want a five-stringed fiddle”. It would seem like sacrilege to do that kind of thing to an excellent classical violin. I was fascinated by the fact that a violin looks symmetrical from the outside but not on the inside (just like us human beings). I started wondering how the vibrations of the violin’s strings are transformed into sound. And I made my first asymmetrical violin in 1966 (see photo above). It looked nice, I thought, but it didn’t sound that great. It took me more than forty years to find out why. 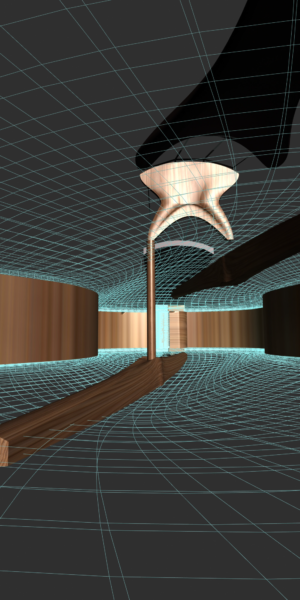 In the meantime, CAD/CAM techniques had been developed. Could they help to solve my problem? Can you make a good, and perhaps an excellent, violin with fewer parts and less effort?As good as an classical violin, but different. An instrument to extend the range of violin players, not just a replacement.This question is crucial for the kind of violin I had in mind. but apply (with appropriate changes) to any bowed instrument. The sound is produced by the elliptical movement of the strings when they are bowed. 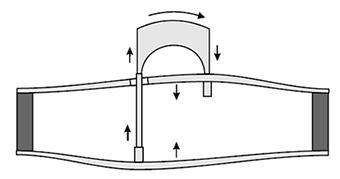 This movement makes the top of the bridge move slightly from side to side. The arrows indicate the resulting movements of the top plate and back. It is these vibrations of the top plate and back that generate the sound you hear when the violin is played. The Dutch Violin is asymmetrical. The ribs are massive but light, the back and the top plate are made of spruce, cedar or any other lightweight tonewood – though designs using any other lightweight material or membrane are also possible. One leg of the bridge is connected to the bass bar mounted under the top plate. 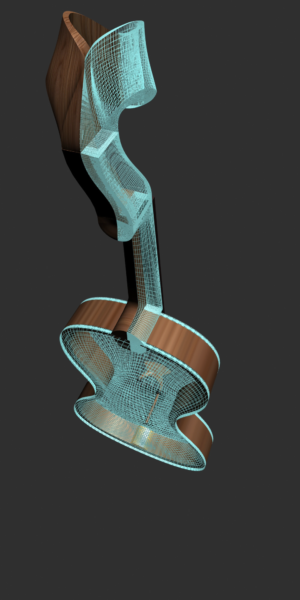 The other leg of the bridge is connected to the sound post, which rests on the bass bar mounted on the back of the violin. The sound post passes through a hole in the top plate. The back and top plate vibrate in opposite directions. As a result, these vibrations enhance one another, providing a greater effective vibrating surface area. This means that the top plate does not have to vibrate as hard as in the classical design. The new design converts the movement of the strings into sound more effectively. This benefit can be used to improve and shape the sound in different ways, for example by varying the type of wood used, the curvature of the top plate and the back, and the size and positioning of the bass bars. The strength of the construction largely depends on that of the ribs.The massive ribs used in this design can also house any electronics or other add-ons included. The use of modern digital techniques such as computer numerical control (CNC) makes the design and production process much more flexible. You can just choose the design variables you want to change in your search for the optimum design. CNC-made parts are more or less identical, and thus interchangeable. 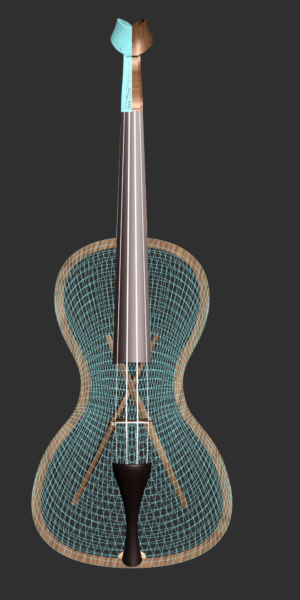 CNC makes the design process more flexible (for example, you could make a mirror violin). CNC files make it possible to produce anywhere in the world, using uniform digital data and locally sourced materials.